Mocking at the grand opposition against his party, PM Modi said "our friends in the opposition are very funny." PM Modi in his speech, targeted P Chidambaram calling him the "recounting minister". 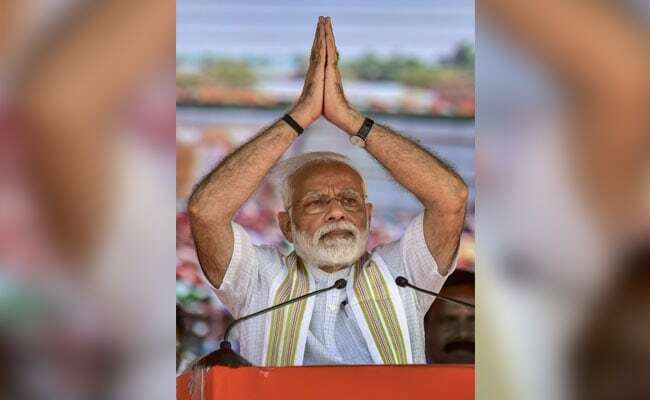 Prime Minister Narendra Modi took a swipe at the Congress today at a rally in Tirupur, saying the good work of the NDA government has made some people very unhappy. "Those who thought power was their divine right, those who thought only they are bound to rule are disturbed. Because here is a government that is working. Their unhappiness has turned into desperation and abuse," PM Modi said. Taking potshots at the opposition for what he said was blaming him for every issue, the Prime Minister said their answer for any question posed to them targeted him. He said it was the NDA government which took the initiative to shut fake companies, remove fake beneficiaries and ensure that middlemen no more roamed the corridors of power. Without naming anyone, he said that only in the services or products like mobile recharge or ice creams, was the idea of a "family pack" seen. But now it applied for bail too. Mocking at the grand opposition against his party, he said "our friends in the opposition are very funny." However, "what is the agenda of the so called alliance, what are the issues they fight for, nobody knows. Because their guns are only aimed at me. This is ''maha milavat, or adulteration." The people of Tamil Nadu and the entire nation are seeing through this game, PM Modi said. The "Mahamilvat" or "adulterated alliance" is a club of rich people trying to promote their dynasties. They neither understand poverty nor have a vision to serve the poor, he said. "The opposition is good at one thing and that is to spread panic. Time and again they have tried to mislead farmers, workers and youngsters." In an apparent reference to senior Congress leader P Chidambaram, Prime Minister Narendra Modi on Sunday taunted him as a "recounting Minister'' of the UPA regime, describing him as ''arrogant''. Citing his government's step of offering tax exemption for those with incomes upto Rs five lakh, he told a public rally in Tirupur that it was a reflection of genuine concern for the middle class, unlike the previous UPA regime. After referring to this step, PM Modi said he wanted to recall the state of affairs during the UPA regime. When the people responded loudly, he said,"right, the "recounting Minister," without directly naming the former Union Finance Minister. P Chidambaram, now a Rajya Sabha MP, won the 2009 Lok Sabha election from Sivaganga constituency in Tamil Nadu by a slender margin of 3,354 votes after a see-saw battle. P Chidambaram, then Home Minister, was declared elected later after the votes were tallied again vis-a-vis the final round. PM Modi had made the same "recounting Minister" remark during his 2014 Lok Sabha election campaign. Continuing his attack on P Chidambaram, PM Modi said described him as "the man who thinks all the knowledge in the world resides only in his brain. In his typical arrogance, he says why is the middle class so worried about price rise when they buy such expensive ice cream and mineral water." P Chidambaram, highly critical of the PM Modi government, had days ago targeted it on the row over the "National Sample Survey Organisation''s data on high unemployment," (as per the report of a business daily) and related developments.